Meet newlywed Mr. & Mrs. Kohli. Yes! 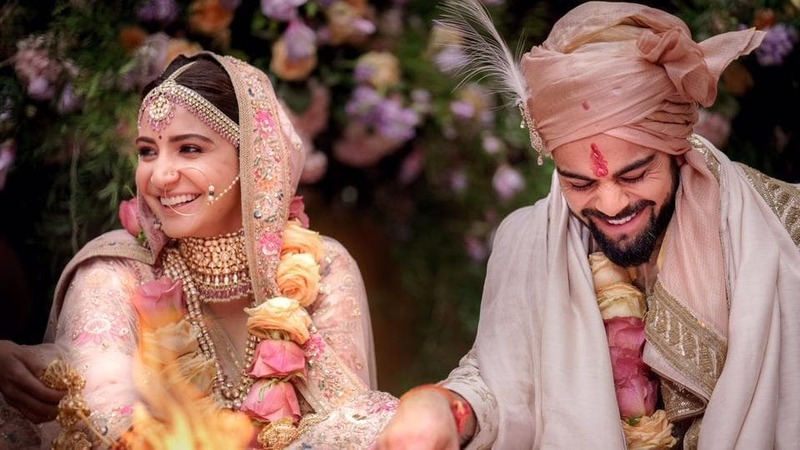 putting an end to sprawling marriage speculation Virat & Anushka are finally married. In a hush-hush wedding ceremony on December 11, the duo tied the eternal knot in presence of close friends & family in Tuscany, Italy. The wedding happened at a most luxurious hamlet in Italy, though the ceremony was kinda isolated but took place in most expensive holiday homes of the world. “Today we have promised each other to be bound in love forever. We are truly blessed to share the news with you. This beautiful day will be made more special with the love and support of our family of fans & well-wishers. Thank you for being such an important part of our journey“. Psst: Isn’t she looking gorgeous in pink Sabyasachi Lehenga. No doubt Anushka steals the boho style look in this Sabyasachi designed Fuschia pink & Indian orange lehenga. OMG.. We can’t keep eyes off them.